This Virtual Race starts on April 1, 2015 and you have through April 30, 2015 to complete your 5k or 13.1mi race. You can log your miles indoors on a treadmill or outside…your choice! Your favorite walking/running route indoors OR outdoors! Registration packets (bunny ears, race bib, and some other treats) will go out every Saturday. Results will be accepted from April 1st - April 30th. Awards will be calculated and posted on May 2nd. Finisher t-shirts, medals for half marathon participants, and awards will be mailed May 4th. Registration will close April 15, 2015. Anticipating that we'll see results submitted from treadmill runs, trail runs, road races, and perhaps an elliptical session or two, we're going to do our best to keep a leader-board going for everything that we see. A virtual race is one that you do on your own time and on the course of your choosing. You have until April 30th to complete the miles. So as long as you complete the miles within the time-frame given, you've completed the challenge to earn your finisher’s prizes. Why a virtual race this year? Due to schedule conflicts we couldn't host an onsite version of the race. But we wanted to keep the spirit of the event alive! This years virtual races allows you the freedom and flexibility to fit your workout in with your lifestyle and schedule. It can be completed anywhere on the planet, indoors on a treadmill; outdoors in your neighborhood; solo or with a group, or even in another race. Step 1: register for your races. Step 2: Complete your distance on or before April 30th, 2015 for your chosen race. Step 3: Submit your time; and we will ship your finisher goodies! Most of our participants use an app on their smart phones like NikeRun or MapMyRun but you can also track your efforts with a gps watch. 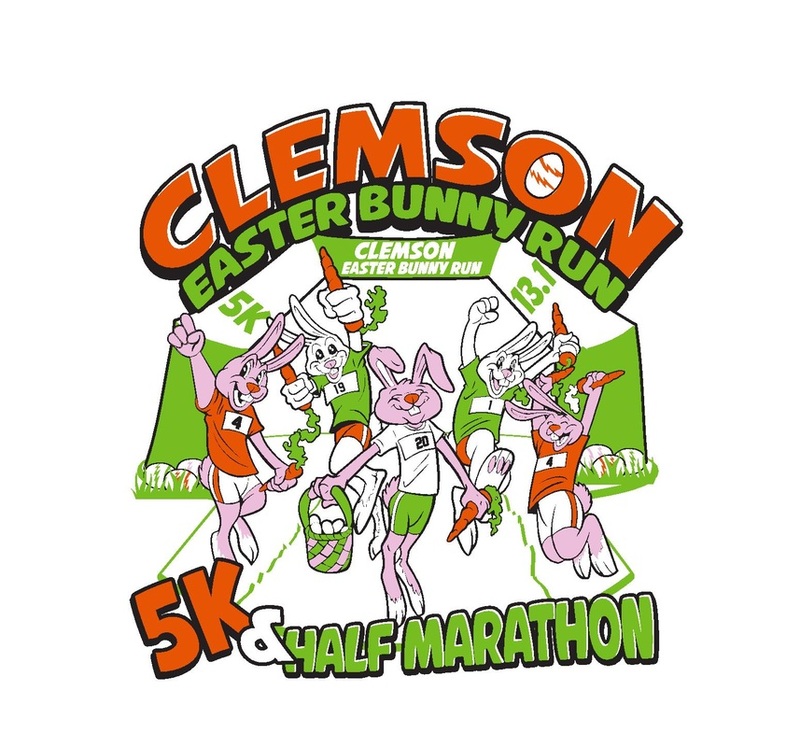 1: Our most preferred method is to post your results on our Facebook wall (http://www.facebook.com/AdventureGeeks) with the #ClemsonBunnyRun #5k or #HalfMarathon so our community can congratulate you. We also love it when participants post a picture with their bunny ears and link to results. 3: Direct message us on Facebook to report your results. Since you can complete this even on your own terms there are no refund options for the event this year. Update #1 - Why we're hosting a virtual run this year.